The Free Dictionary Language Forums » English » The Free Dictionary Daily Feed » Quote of the Day » He died...of a broken heart, a distemper which kills many more than is generally imagined. Yes, I actually do think that people die because of broken hearts. but only dogs die of distemper. Sorry to lower tone - couldn't resist! The above quote is below in complete text. other diseases, namely, that no physicians can cure it. Attributed in Maturin M. Ballou _Treasury of Thought_, p. 123 [10th ed. 1884]. After reading about animals and distemper and the need to kill most of them. I'll take a broken heart or no involvement at all. I thought 3M is possible to "stick" the pieces of broken heart. Am I wrong? I think doctors are finally realising that heart surgery and heart medicine is a lot easier than heart healing! Poets and song writers may feel vindicated to learn that Science has finally validated "Broken Heart syndrome:"
"In many legends and fictional tales, characters die after suffering a devastating loss. But even in reality people die from what appears to be a broken heart. Broken heart syndrome is commonly blamed for the death of a person whose spouse is already deceased, but the cause is not always so clear-cut. The condition can be triggered by sudden emotional stress caused by a traumatic breakup, the death of a loved one, or even the shock of a surprise party. Broken Heart syndrome is clinically different from a heart attack because the patients have few risk factors for heart disease and were previously healthy prior to the heart muscles weakening. The recovery rates for those suffering from "broken heart syndrome" are faster than those who had heart attacks and complete recovery to the heart was achieved within two weeks . A study has shown that a broken heart hurts in the same way as intense physical twinge does. The research demonstrated that the same regions of the brain that become active in response to painful sensory experiences are activated during intense experiences of social rejection. "These results give new meaning to the idea that social rejection 'hurts'," said University of Michigan social psychologist Ethan Kross, lead author of the article." Science has yet to discover, however, a real "Man in the Moon," barring Neil Armstrong, et al. What I find "discouraging" is your inability to understand and appreciate something as profound and insightful as what this man said. That is indeed sad. My sympathies. ETA:I just realized it could be misinterpreted. I am not calling the author sissy. Just the person who would die of heartbreak. When I am being flippant I like it to be accurately flippant. Hi sisi. I was just wondering what is "3M". Marissa: 3M is a glue that I always use to heal my broken heart. Thank-you. Now I know. :) I will remember to use it in the future. On today's quote and comments: Maybe we're suffering from jet-lag -- or maybe just not fielding will. A heart transplant could be necessary. Here is something from me to you--and to everyone whose heart is broken beyond repair. I think time is broken, too. It tends to repeat itself. 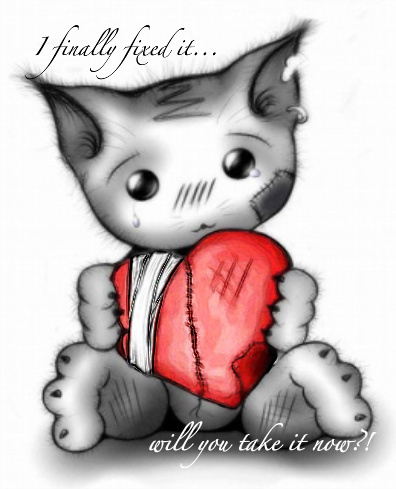 As for broken hearts, you need to let the wound callous over. Either that or shock treatments. 1. Having calluses; toughened: callous skin on the elbow. 2. Emotionally hardened; unfeeling: a callous indifference to the suffering of others. I would hope ones heart would mended but not become calloused. I say this only because it means to harden ones heart and to harden ones heart I would think be worse. I have been wondering today about your post--the part about: "I think time is broken, too. It tends to repeat itself." I don't understand your meaning, and it has been troubling me. My interpretation of your statement may not be what you mean. I have never considered one's life being shattered in this way...or I should say in these words. This idea causes me think of one's life existing outside of time, or without time, or on the periphery of time, or in a place where time has stopped. It is like existing outside of life...something like that. And, how do you mean "it tends to repeat it itself"? What part are you talking about that repeats itself?